Indiana State University emerged from the starting line in April 2006 with a minor in motorsports management. Today, the minor and ISU's related Motorsports Studies Initiative are doing more than getting current and future students revved up about the possibilities. We're showing the world that ISU is responsive to the needs of the industry – an area of growing importance, economically and otherwise, to the state of Indiana and the nation. Investigate the feasibility of Indiana State University creating multi-disciplinary programs at all levels concentrating on the business and management of sustainable and successful motorsports businesses, including, (but not limited to), individuals, teams, technology, and high performance engineering. To advise on the framework of a state-wide Workforce Development Plan under the Governor of Indiana’s Motorsports Taskforce and economic development agencies. To build partnerships that will enhance the motorsports studies program at Indiana State, nationally and internationally. To improve the educational preparedness of students entering the motorsports industry by providing a program of study of the highest quality. Just an hour’s drive from the home of the greatest spectacle in racing – the Indianapolis Motor Speedway – Indiana State University in Terre Haute, Indiana, is strategically positioned to make its mark on the motorsports industry in a fresh and dynamic way. At Indiana State University, motorsports is our passion and heritage. ISU is located in Terre Haute, Indiana, home to the Hulman family and just one hour from one of the most famous racetracks in the world - the Indianapolis Motor Speedway. Lucas Oil Raceway in Clermont, Indiana, home to the National Hot Rod Association's legendary U.S. Nationals, drag racing's version of the Indy 500, is even closer. Racing is in our blood. Developed with the assistance of our alumni and professionals currently working in the ever-changing field, the university's professional colleges are collaborating to deliver a multidisciplinary motorsports management minor. With 6-10 faculty members committed to the continued growth of the program, Indiana State University is the leader on the track in addressing the overall needs of the industry. 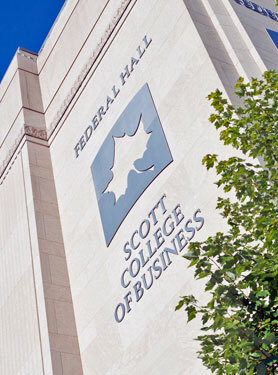 Central to the minor is Indiana State's AACSB accredited Scott College of Business, which provides courses addressing such topics as risk management, marketing and sponsorship, race team management, and the future motorsports industry. The College of Technology provides the theory, laboratory, and practical experiences in automotive engineering technology, electrical engineering technology, and mechanical engineering technology needed for technical and management careers in the industry. The College of Nursing, Health and Human Services provides courses that address issues such as human performance, public relations, facility design, and event management to our students. Besides the classroom, students may be involved with motorsports through a variety of opportunities, such as Team Sycamore Racing, Indiana State University's student-powered drag team engaged in every aspect regarding the business of drag racing. In addition, any student may join the Sycamore Motorsports Association, a student-led campus organization focusing on their common interest in motorsports. The motorsports industry continues to benefit from our graduates. Our program and experiential learning opportunities help students learn if they really have the education, passion and drive necessary to be a winning force within the industry.